What would it take to survive a zombie outbreak at the World Series of Poker? That idea was explored in World Series of Zombies (WSOZ), a poker-themed comic book released this earlier this summer at the 2015 World Series of Poker. The comic, which is not associated with the WSOP but still features some of the game's biggest names, is available electronically on Comixology for just $1.99, while physical copies can be obtained for $5.00 at either MaximumComics.com or at the Blue Shark Optics booth inside the Rio. As a special treat, a limited edition variant cover was created for 1,000 issues of WSOZ. 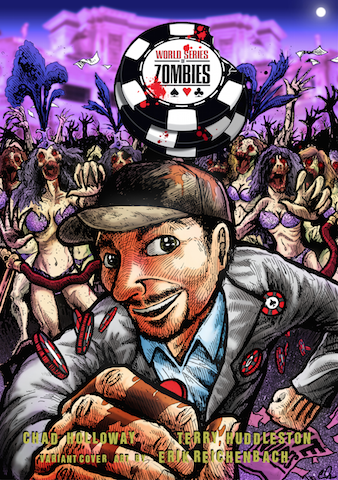 That limited-edition cover, which features poker pro Daniel Negreanu fleeing zombified Las Vegas showgirls, was created by Erik Reichenbach of Pinckney, Michigan. If that name sounds familiar that's because it's the same Erik Reichenbach that appeared on CBS's Survivor Micronesia, Fans vs. Favorites back in 2008. 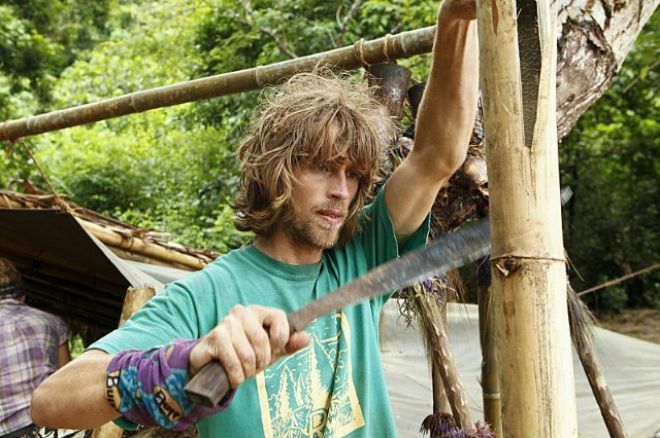 Five years later, he returned for Survivor Caramoan, Fans vs. Favorites II, this time as a favorite as opposed to a fan. In addition to being a renowned Survivor contestant, Reichenbach is also a comic artist and graphic designer. Reichenbach, who received a Bachelor's of Fine Art from Eastern Michigan University has had his works featured in Entertainment Weekly, People.com, and RobHadAWebsite.com. We caught up with Reichenbach for a short interview regarding his WSOZ experience. PokerNews: What influenced you to draw the variant cover as you did? What inspired you to use showgirls? Reichenbach: When I first started coming up with sketches for the cover I kept coming back to the horde of zombies behind Negreanu and what I could do to make them distinct. The idea of zombie showgirls made the most sense for a zombie apocalypse in Las Vegas. The juxtaposition of terrifying showgirls coming after the patrons just felt like the right way to put zombies into the world of poker. How would you describe your comic style? My style relies on bold color, eccentric characters, and lots of movement. I always am looking at the big picture and creating as much of the world in one image to bring the viewer in. What inspired you to draw Daniel Negreanu as the poker player on the cover? After reading through the first issue Daniel stood out to me as the character I wanted to feature. While all the major players have their own iconic look it just kind of fell into place by coincidence - while searching Negreanu online various sites popped up with women debating who Daniel's current girlfriend was and their desire to be with him. It only made sense then for Daniel to be pursued by a horde of showgirls on the cover! What is your experience with poker? I enjoy playing poker with family, but having two brothers that are exceptionally good at it doesn't help. Surprisingly the best hands I have ever had in poker all have the theme of being "666". Not surprising considering my artistic start in Hell, Michigan. What are your thoughts on the zombie genre? I've always been a fan of zombies and my appreciation for the genre has only grown over time. It's interesting having human beings turned into savage creatures when they are bitten and turned into zombies and when the uninflected humans resort to doing horrible things against other humans to stay alive. Do you have any comic-related projects coming down the pipeline? Right now my big project I'm working on is Islands of Chaos, a strategic mobile app game where players all over the world compete in Minigames and the losing players band together to vote each other out. The game is inspired by reality television shows and should launch this year. Visit www.islandsofchaosapp.com for more updates and info. Follow Reichenbach on Twitter @BloodyAmer1can, and be sure to check out his other comic projects at erikreichenbachcomics.com. *Lead photo courtesy of imdb.com. Ben "Bttech86" Tollerene During 2015 WSOP: "Online Poker is Getting Tougher"